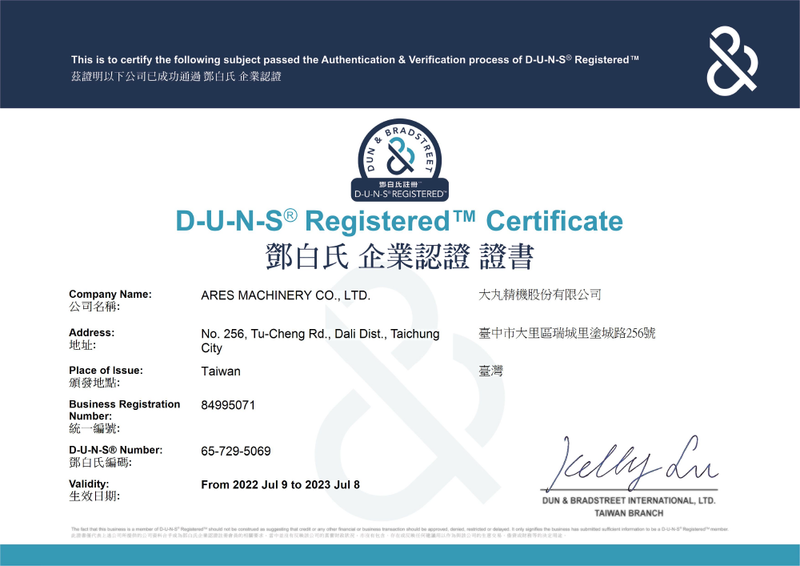 In July of 1994 Ares-Seiki was founded on the maxim “Quality as Priority Guarantees Durability, Perpetual Service Ensures Vitality.” Since the beginning this has depicted the company’s policy towards quality. Years of affirmation by its clients both domestic and abroad confirms that Ares-Seiki delivers machines of high quality and functionality, and that its service is exceptional. Company growth is constant, evident in the company’s move to a new factory in Dali City, Taichung, 2001. Insisting on maintaining the same standards and quality as advanced countries, the company was EMC and CE certified in 1996, ISO9002 certified in January of 1999, and TUV of Germany granted ISO9001-2000 certification in 2002. Providing the client with both top quality advanced machinery as well as excellent after sales service is a tradition for Ares-Seiki. We seek mutual growth along side our customers by helping to increase their productivity while maximizing their ability to compete.